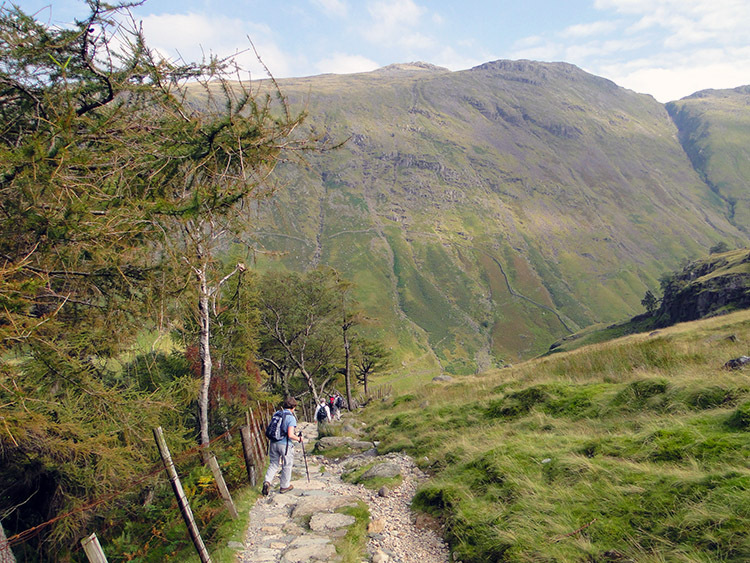 Summary: This is a super walk in the area of the Lake District I first got to know. 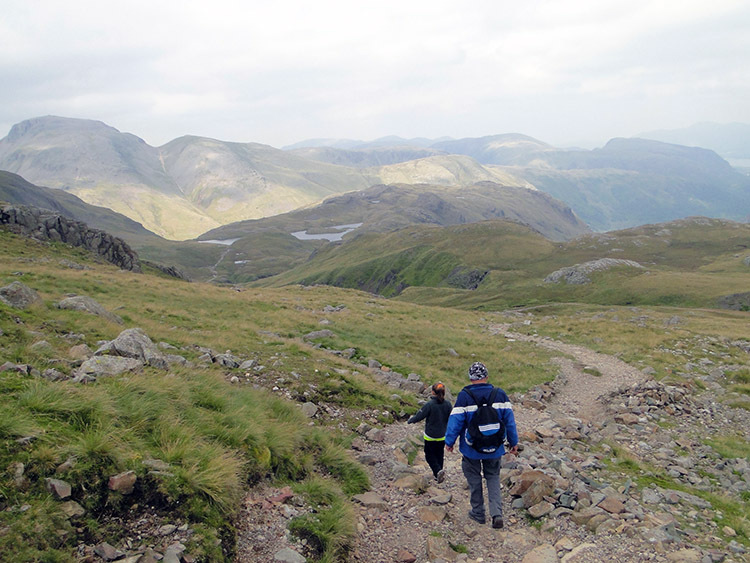 Early on in my walking career my friends invited me to join them on a walk to Scafell Pike, the highest mountain in England. 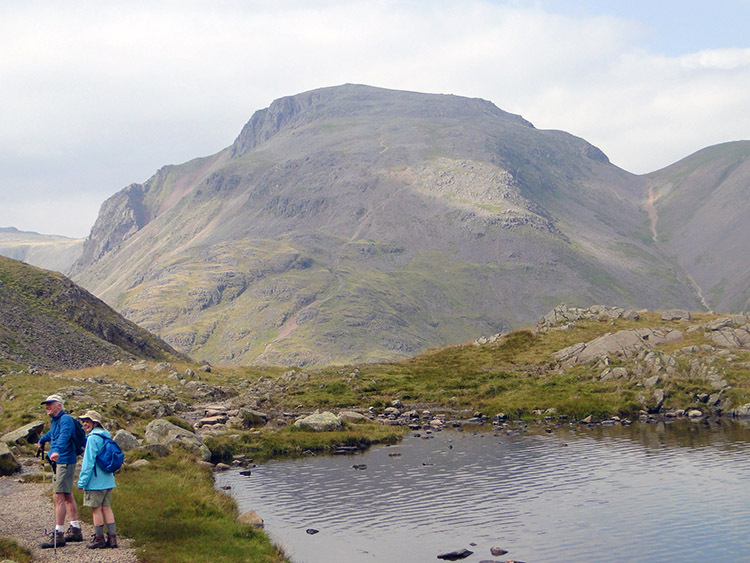 as soon as I embarked on that first Lake District walk I was instantly hooked, not just by the climb to Scafell Pike but by the whole experience of walking from Seathwaite to Styhead Tarn and then by the Corridor Route to the mountain. I have done that route many times now and in doing so neglected the other great mountains and great routes in the area. The Walk: It was three weeks since I finished my long 1,120 mile walk down the length of Great Britain and just over two weeks before I returned to work when I took a few days out to take in a couple of walks in the Lake District. It was late August, the signs of Autumn were already appearing with longer nights and the fresh green colours of the trees giving way to darker shades and brown tinges in the leaves of some species. 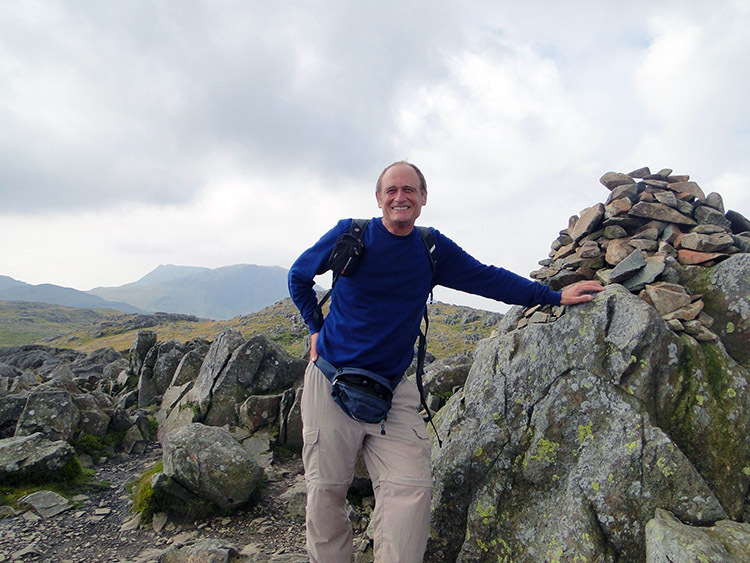 Having contacted a few friends of my intentions, Tim Nobes took up the baton to join me on one of the walks and he chose this one which would take us on a circular journey of some of the spectacular but less frequented mountains in the area of icons like Scafell and Great Gable. As we met up at Seathwaite Farm the weather was set fair with glints of sun already breaking through the early morning cloud. We were fortunate to enjoy such a good day out. Tim and I set off from Seathwaite Farm knowing the hardest work of the day was in the first couple of hours by making a steep ascent of the west face of Glaramara on a track that runs parallel to the south side of Hind Gill which runs off the top slopes of the mountain into Grains Gill. After a short walk, a missed gate and a few hundred metres of extra walking we returned to the gate accessing the ascent path. Because of the fitness regime that was the 1,000 Mile Walk which entailed 80 continuous days of walking with a heavy backpack I was up and away quickly and making good ground. Tim having only walked occasionally in the summer and compromised by preparing for the new school term steadfastly followed me up the slope. The big advantage of making the high ground immediately is that the far and wide mountain views are quickly realised. Soon after starting the ascent Tim and I were looking all around. 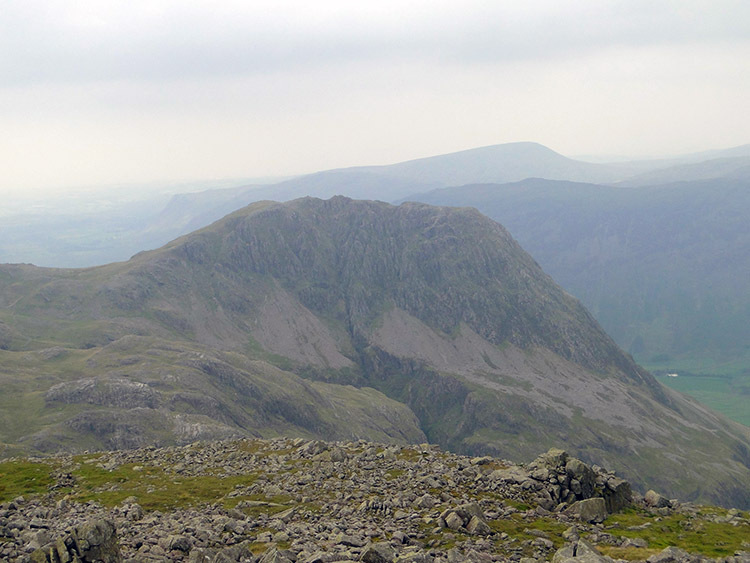 Great Gable was appearing over the top of Seathwaite Fell. The Derwent Valley and the distinct forested top of Castle Crag also came into view. Further up the lofty heights of Allen Crags and Great End, both targets for the day were spotted and the more we climbed then other mountains featured including Brandreth and Grey Knotts. 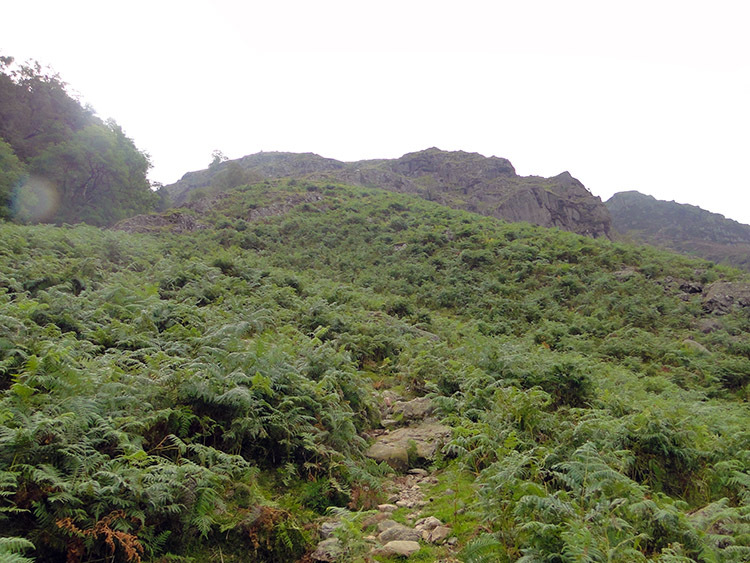 After skirting round the north side of Hind Crag and at around 500m we turned our attention from the views to the rock immediately around our feet. A seam of marbled rock took our interest; it always fascinates. After much effort Tim and I reached a point where the ascent became less of a strain and more enjoyable. 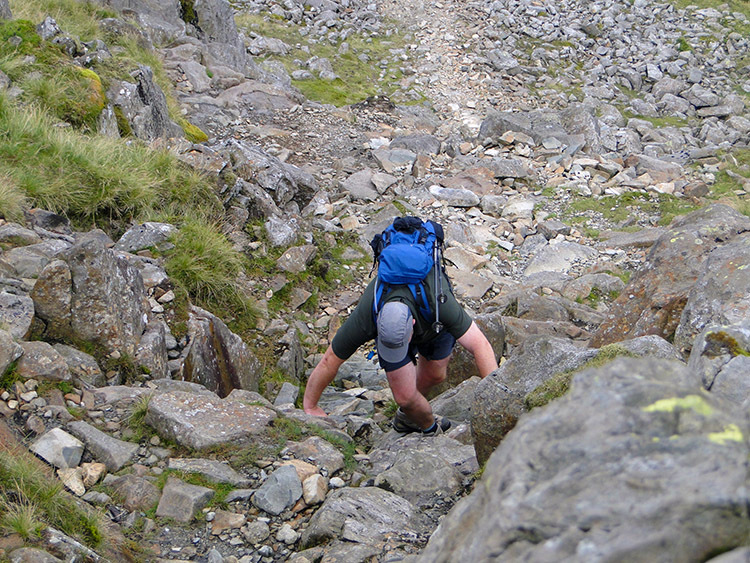 We could now walk upright rather than pitching ourselves forward and from the 600m contour it eased further before we took on Glaramara's final challenge of scrambling to the rocky summit tor of the mountain at 783m high. We had climbed over 650 metres already and we were only at our first mountain top of four. However we were in the comfort of knowledge that the climbing of the remaining three was less in total than what we had done already. 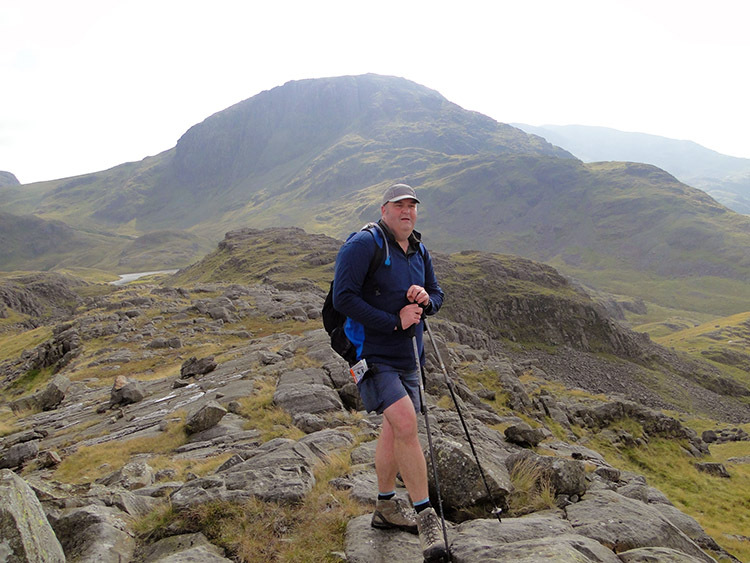 That was a good feeling and the emotion was exemplified by the tremendous views from Glaramara. 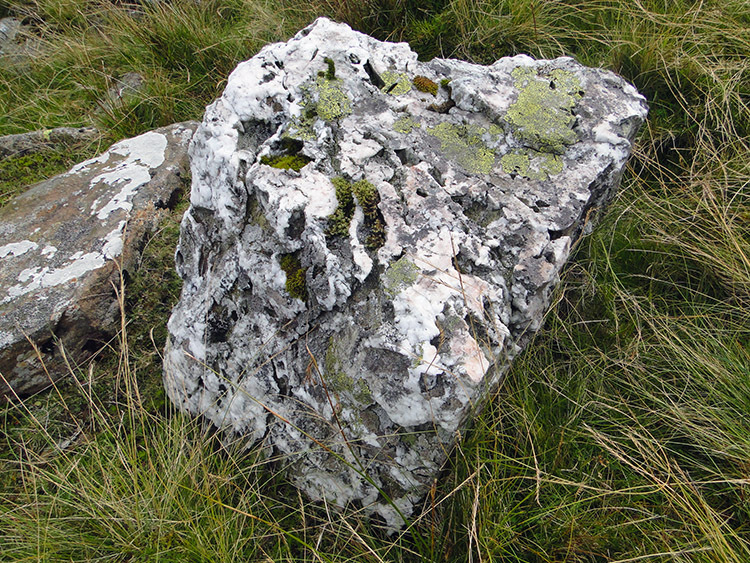 Wainwright himself, in his unique Pictorial Guide to the Southern Fells puts it perfectly "Glaramara's unique situation, in the heart of the district yet isolated by deep valleys, is emphasised by the splendid view. 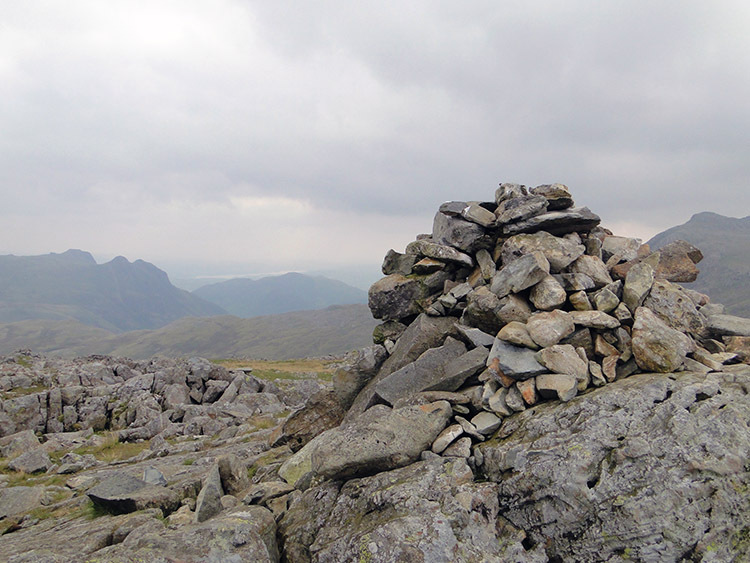 Beaten in height by many fells but overshadowed by none, the summit provides a spacious and interesting panorama"
And what panoramas they were. 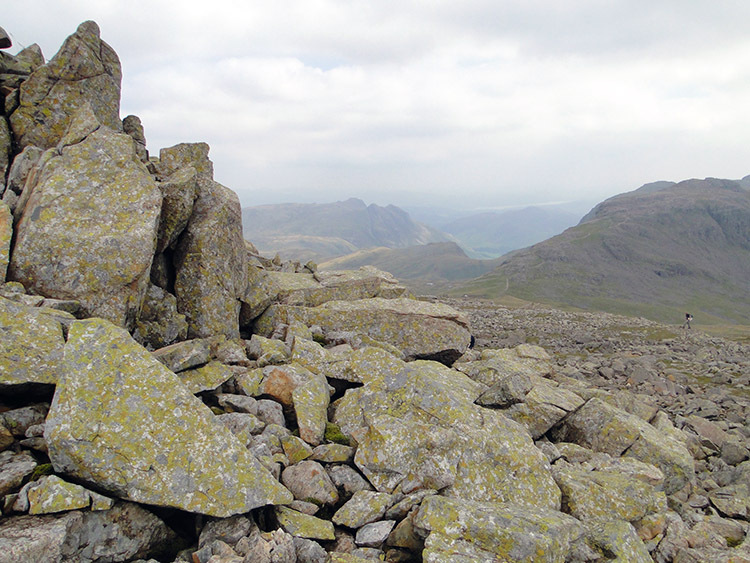 While on the ascent our attention was fixed to the north and west with Great Gable being the predominant fixture. 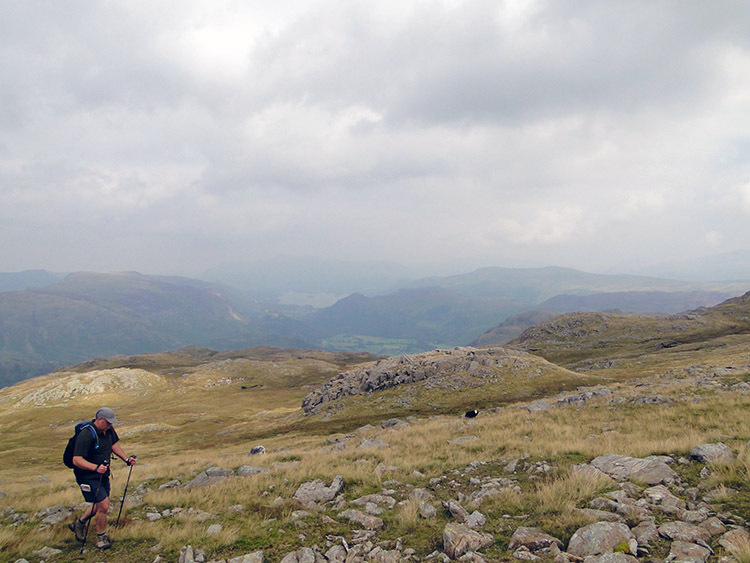 Now we had made the top ground of Glaramara and were making our way south to Allen Crags the breathtaking views to the east and south were at our disposal. And what a view we had with the fair summer weather giving us all on offer. The Skiddaw and Blencathra ranges were to be seen in the north east. Due east were the Dodd Fells and the Helvellyn range. 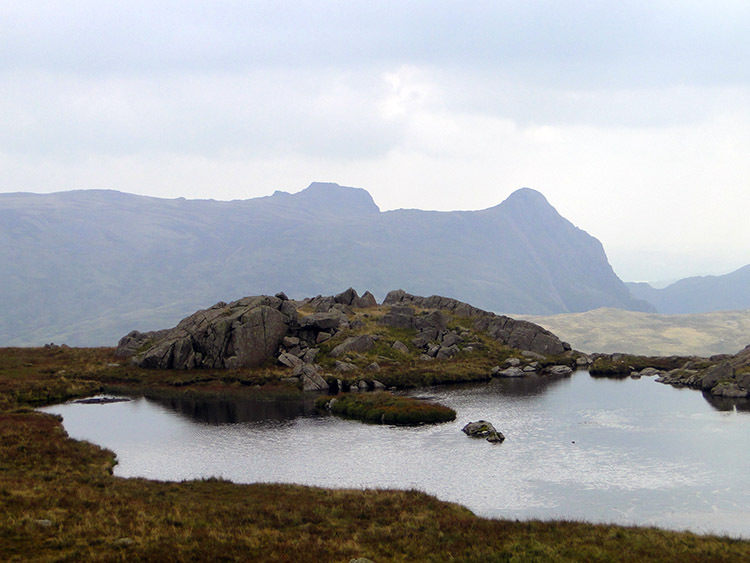 Closer to the south east were the Langdales with the iconic rounded dome of Pike O'Stickle dominating for attention. Due south and closer still were Crinkle Crags, Bowfell and Esk Pike. It was a stunning spectacle. 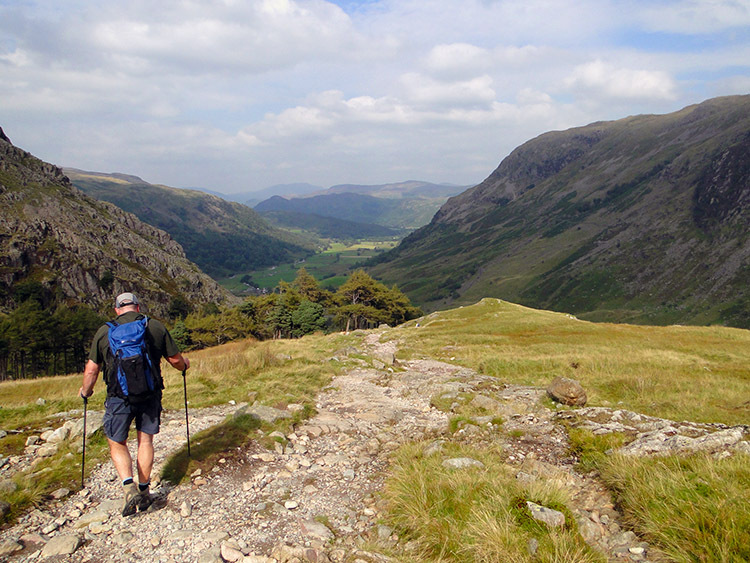 With the views we were experiencing the walk to Allen Crags was pleasant, easy and immediate. In fact, apart from a sharp descent after Looking Steads we were there before we knew it; our minds had been in constant activity enjoying it all. From Allen Crags we descended to take lunch at Esk Hause before we continued on to the summit of Great End by a direct route before descending back to Esk Hause via Calf Cove. The summit of Great End best served our day walk by providing the best views of Scafell Pike, almost exactly one mile to the south west. We could clearly see all the Pike baggers from Great End, a peak that is nearly always occupied befitting its status as the highest point in England. Great End, at 910m high was also our highest point of our day, it being the fifth highest of all England's mountains itself. From Esk Hause we followed the popular track to Sprinkling Tarn and while doing so passed a gentleman who was accompanied by his enthusiastic daughter. She spoke of her enjoyment in the mountains without breaking breath as we passed them. He chatted to us as we passed, clearly enjoying himself too but clearly pleased to have some diversionary conversation. Soon after passing them we met four young adults, two male and two female who were taking a break beside the path. They told us they were enjoying the rest while a couple of their colleagues were geocaching higher up on the south west slopes of Great End. It was clear they were. After our meetings we reached Sprinkling Tarn before stepping off the path to follow a track on the north side of the tarn to head for Seathwaite Fell. Both Tim and I were in great heart as we made our way past Sprinkling Tarn and past some tents pitched by the side of the tarn. The sun was beaming down on a wonderful balmy afternoon as we followed the path from Sprinkling Tarn to Great Slack and then to the highest of a series of cairns which marked the summit of Seathwaite Fell. In doing so Tim bagged his first and only Wainwright of the day while I collected my fourth. Despite its lower altitude at 632m it still provides one of the best views of Great Gables and Green Gables eastern aspects and with a penetrating unbroken view of Windy Gap and Aaron Slack which separates the two mountains. 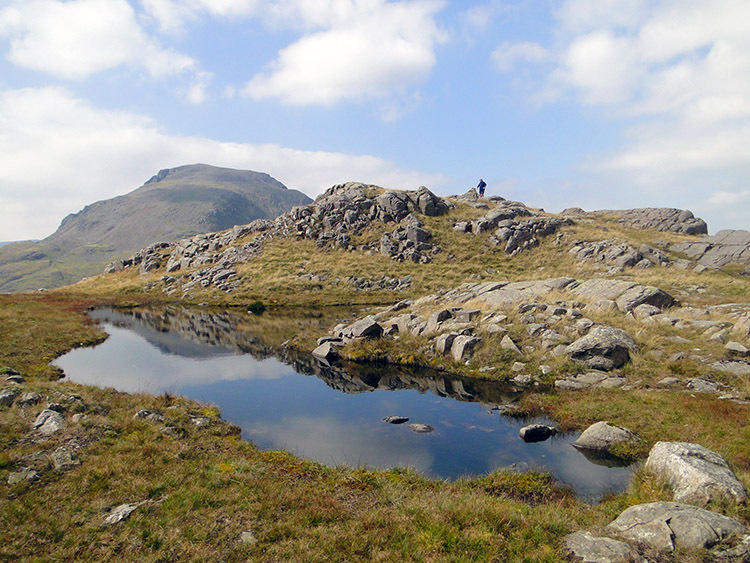 After taking a short and final break at the summit of Seathwaite Fell and with all our climbing work done we now had a pleasant journey down home which we began by retracing our tracks to Sprinkling Tarn. 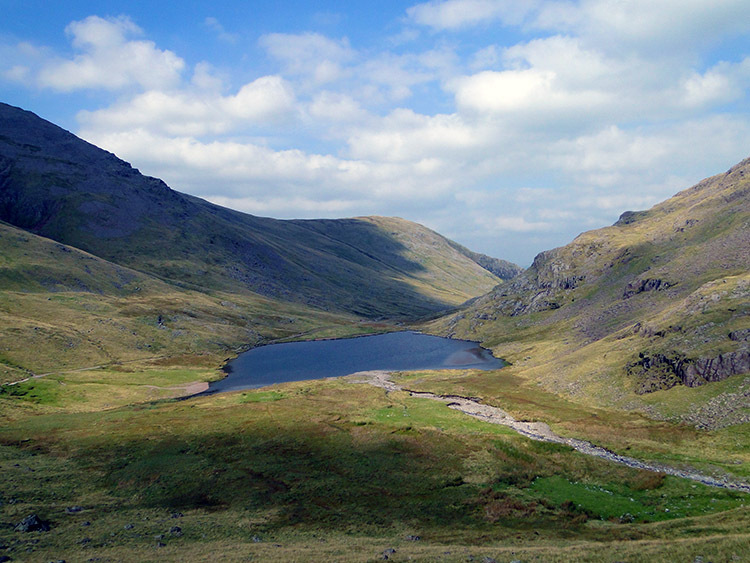 Enjoyment abounded from Sprinkling Tarn, first by a walk down to Sty Head and then past the west edge of Styhead Tarn to follow Styhead Gill to Patterson's Fold and then gently down to Greenhow Knott. 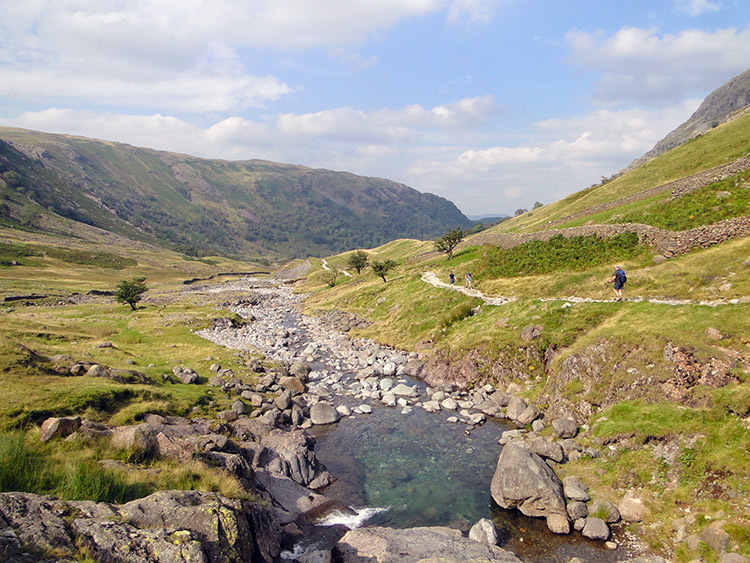 It was a pleasure walking this way for I have seldom done it, more often walking up the track from Seathwaite toward Styhead Tarn and the Corridor Route to the Scafell range. The aspect of Seathwaite as it appeared as we approached Greenhow Knott was quite different to my usual course down Grains Gill. This way, the work we had done in climbing the steep path to Glaramara earlier in the day was clear to see making it more dramatic and thus better appreciated. From Greenhow Knott the path to Stockley Bridge becomes steeper and has to be taken carefully. On the descent Tim and I passed a host of walkers returning from their exertions, most likely on either the Gables or the Scafell's Despite the work done by them most were still in good spirit and conversed pleasantries with us. How could they not do so, it had been one of the fantastic days in the mountains after a changeable summer. A wonderful day indeed and mine had been made much more so by Tim's company. 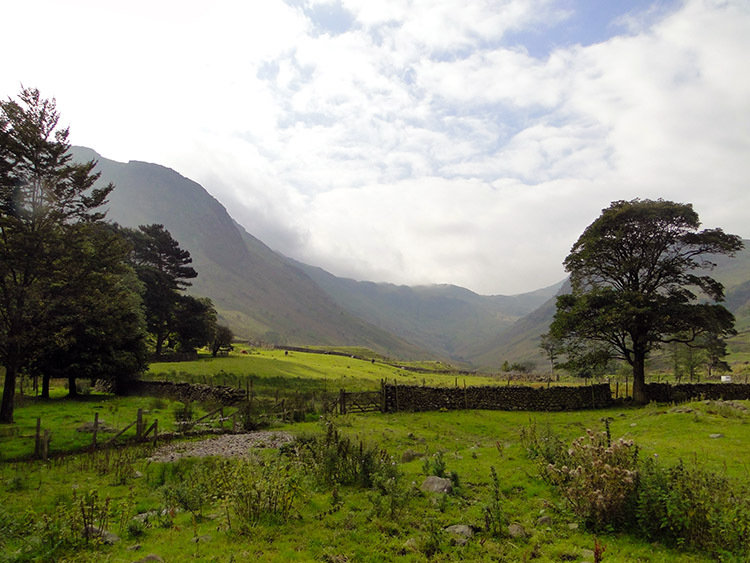 A short walk from Stockley Bridge and we were back at Seathwaite Farm and at the point at which we has started. We were both pleased with ourselves, a great day out was done.